He wants to take a “BAT” to the MTA. City Council Speaker Corey Johnson on Tuesday proposed breaking up the state-run MTA and transferring city trains and buses to a mayoral-run agency called “Big Apple Transit” — or BAT. Johnson, who is mulling a run for mayor in 2021, outlined his vision for improving mass transit during his first State of the City address at LaGuardia Community College in Queens. The speaker hopes to bring the subways, buses, Staten Island Railway, MTA Bridges and Tunnels and portions of the authority’s headquarters under the mayor’s control to sidestep what he describes as political interference from Albany that has plagued city transit for decades. But several proposals hinge on state approval, presenting potential hurdles for Johnson’s plan. For one thing, his proposal hinges on the passage of congestion pricing — the plan to toll Manhattan motorists below 61st Street — and its anticipated $1.1 billion in revenue. The state is mulling such a plan — which has been met with some resistance — but Johnson said the city could pass its own congestion plan if Albany doesn’t. “If the State Legislature fails to pass an acceptable congestion pricing plan in 2019, the Council can and should pass its own plan,” a summary of his remarks says. He also seeks to expand the city’s taxing authority to fuel the BAT’s budget without relying solely on fare increases — another move that requires the state’s blessing. Meanwhile, he says he wants to rein in construction costs by addressing bloated construction union contracts and implementing more design-build projects to curb the cost of dealing with multiple contractors. Johnson’s plan, outlined in a 104-page report titled “Let’s Go,” calls for a complete overhaul of how New Yorkers get around – with far less emphasis on driving and significant upgrades to the city’s bus and bicycle network. Seeking to increase bus ridership 16 percent by 2030, Johnson is proposing new dedicated lanes, bus cameras and transit-signal priorities, as well as the creation of 30 miles a year of new lanes. He also wants to create a “fully connected bike network” by 2030 that includes equipping “every square mile of the city’s street grid with bike infrastructure” – including dedicated lanes, the report says. Johnson also said he’d also like to see private ownership of cars drop citywide by 50 percent by 2050. And he suggested cutting the city’s fleet of vehicles — which currently totals over 31,000 — by 20 percent as of 2025. The announcement between the Mayor and the Governor was meant to preempt this. Yes! Corey Johnson for Mayor 2021! I haven't read that far into it, but this is very impressive! Before spending $4 billion to reconstruct a 1.5 mile stretch of highway, the City should study alternatives to the reconstruction of this Robert Moses-era six lane road, including the removal of the BQE in its entirety. 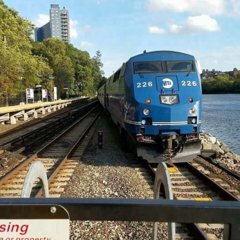 A study and planning effort to overhaul the BQE should start with public engagement and be accompanied by sufficient plans to improve public transit options and mitigate the im- pacts of truck traffic in each scenario, particularly in environmental justice communities throughout the City. The reimagining of the BQE should be coupled with a truck route redesign initiative. I was at the BQE meeting. That's a done deal. Removing it entirely would be far too expensive, not to mention the time involved, and the BQE in terms of its lifespan is coming to an end so it needs to be replaced and soon. The costs would pay itself. Reduced driving, reduced crashes and emissions, better health, restitching the street grid back together, more parks, bus lanes along surface boulevards, and space for businesses and housing. The removal of the highway would increase real estate values. It would be a great investment. See what is being done in Syracuse. A little too late now. That meeting was held last year or the year before that and they were already talking about the need to put weight restrictions on it because of how vulnerable the expressway is. There's a time process with all of this. First, an EIS has to be done which is basically an environmental impact study, and depending on the scope of work that needs to be done... I've seen EIS statements that were 30 pages, while others were hundreds of pages, and these studies eat away important time. They can be at least a year in most cases. Then you have to hold public meetings and engage all of the stakeholders and once all of that is done, THEN you can start talking about starting with the project once a design has been agreed upon, etc. etc. etc. They plan on keeping the BQE open during the project otherwise you'd have massive congestion. A little too late now. That meeting was held last year or the year before that and they were already talking about the need to put weight restrictions on it because of how vulnerable the expressway is. There's a time process with all of this. First, an EIS has to be done which is basically an environmental impact study, and depending on the scope of work that needs to be done... I've EIS statements that were 30 pages, while others were hundreds of pages, and these studies eat away important time. They can be at least a year in most cases. Then you have to hold public meetings and engage all of the stakeholders and once all of that is done, THEN you can start talking about starting with the project once a design has been agreed upon, etc. etc. etc. They plan on keeping the BQE open during the project otherwise you'd have massive congestion. I know that the planning is underway, but now is the time to undo the destruction of the city by the automobile. Even if work was 80% completed on the project, I would be willing to tear it all up to get rid of the highway. Many residents along the BQE in Downtown Brooklyn have signs in their windows arguing for its removal. I don't want it buried. I want it removed completely. Replace it with a surface boulevard like the Embarcadero. As for the city taking over the subway, buses and etc. Is not happening. The city ran city buses and that didn't work out too well in the later years. I would be bummed if the MTA was broken up. As a buff, I thought it was cool that the subway & local bus, express bus and commuter rail systems in lower NY State were all under one umbrella. Also like the fact that info for all those services are all on one website. As for the suggestions in the article, a lot of fantasy which probably won't come close to happening anytime soon. Reminds of when AOC suggested banning Air Travel in the U.S or something like that, WTH. Except AOC never actually said that. All she said was invest in high speed rail corridors (which would make short haul air travel obsolete) and everyone flipped out and interpreted that as eliminating air travel. I don't know what's this obsession with this politician. That's all she is, and then they all say AOC... Spell out the damn word. I didn't know what it was for a while. I know it's long to say Alexandria Ocasio-Cortez, but it's far less confusing. I don't want it buried. I want it removed completely. Replace it with a surface boulevard like the Embarcade﻿ro. Are you talking about the entire BQE? or just the section between Atlantic Ave and Cadman Plaza West? or? I also have reservations about suggestions to replace highways with transit lines as if all trips on these roads are local. I want to remove the whole thing. Also, the GCP between Kew Gardens and Northern Boulevard, the Clearview, the Bruckner, a decked over Cross Bronx, Mosholu, and the Prospect Expressway. Splitting the up in of itself sounds like Fantasy, I’d actually like to see if this politician will be able to pull this off! Those are my 2 cents in this topic. I was very skeptical of the Speaker's plan for municipal control, but his genuine support for the transit and this report have won me over. I hope that it does not hinder integration with the LIRR and MNRR. San Francisco replaced its Central Highway with a boulevard, which revitalized the surrounding neighborhood and caused property values within that area to increase.774 According to research, one reason for an increase in property values after highways are removed is the reduction of local traffic within the area.775 San Francisco also replaced its Embarcadero Freeway, which increased employment in the area by 23 percent within a decade. Please... "Politician"... He's just a public advocate. Nothing more. Most of what he wants to do depends on getting State approval, so he doesn't have all that much say in the matter. Reminds me of this vanshnook article that I read http://www.vanshnookenraggen.com/_index/2018/10/we-dont-need-to-replace-the-bqe-but-we-will/ and this recent SAS article http://secondavenuesagas.com/2019/03/04/the-nyc-transit-system-has-a-mayoral-problem/. All I can say is, in times like these, we need someone to actually represent our city. He was only Acting Public Advocate. He is the Speaker of the City Council, and unlike Mark-Viverito, has stood up against the mayor, and asserted the council's rights.